The first commandment of the Bunny Lord, the Holy Bunny Book teaches us, was to “go forth to multiply.” This He did say to the creatures He had created in the blessed Garden of Lagomorphia. And He did give to them all the Garden for their domain, that they might eat and copulate in endless bliss. Only one thing was forbidden, to eat the Carrots of Knowledge. For some time, the Holy Bunny Book relates, all was well in the Garden. The creatures did nothing but copulate and eat, and eat and copulate, and the Bunny Lord saw this and knew that it was good. But then a fiendish creature came into the Garden, a deceiving beast called a Cat. And this Cat tempted a doe to eat of the Carrots of Knowledge, with subtle phrases and faithless philosophy, and the foolish doe did submit to this temptation. Thus the doe’s eyes were opened, and she gained knowledge of things other than copulation and feeding. Then she gave of the Carrots also to the other creatures, and they gained this knowledge also, and were content no more with their simple lives. One day the all-knowing Bunny Lord came to the Garden, and he saw that his creatures were not copulating. “Why are you not multiplying as I commanded?” He asked of them. Then one of them attempted to explain their reasons, and by this sin He perceived that His creations had fallen. In great anger He cast them out of the Garden, to live in the fields and forests of the wide Earth. For misleading His creations, the Perfect One then commanded the Cat to crawl forever on the ground and eat only of the dust. But the Cat did not obey Him. It was many aeons later, when the age of the Earth was three hundred and thirty-four years (by the calculations of the Church of Copulation), that a bunny named Murch was born. Like all bunnies he was a damned soul, a creature condemned to eternal torture by cats in their horrible land, because of the sins of that foolish doe; but unlike other bunnies, he refused to obey the redemptive teachings of the Church. It began with small rebellions when he was only a kit: he simply refused to eat his own droppings, saying he would rather go to a restaurant. And though this sin was beaten out of him, he still would not follow the path of Purity, spending far more time reading books than copulating. But his true path to heresy began when he began to claim that these books were much older than three hundred years, that they were written thousands of years ago. This the Church could not allow, so Murch was sent to the Warren of Redemption. In that most holy of places, the misguided bunnies of the world were taught the path of righteousness through the use of discipline. Nothing but copulation and feeding was allowed, except on Bunnyday when hymns to copulation and feeding were sung. But even there, the corruption in Murch’s soul showed itself. He convinced other bunnies to take breaks from the copulation when no-one was watching; in secret they engaged in humour and philosophy. When this was discovered, a final attempt was made to save his soul through punishment, but Murch rejected the Holy Faith. Not only that, but he escaped from the Warren – covered as he was in blood from the soul-saving, he was too slippery for the guards to hold. Out in the wilderness, in secret unknown places, Murch learned the dark ways of Necromany. 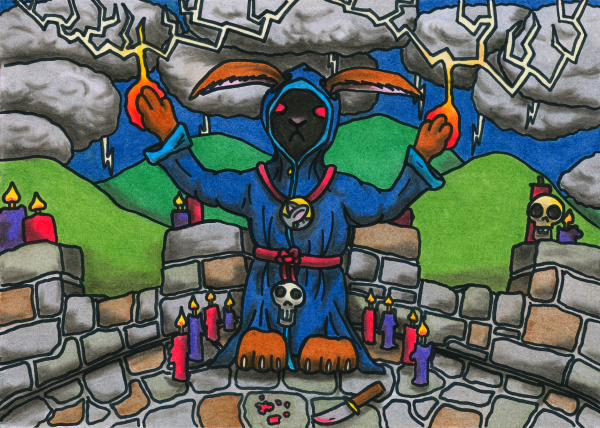 It is said that that three times the Bunny Lord appeared to him there, giving him the opportunity of redemption, and three times Murch refused him. And when he had refused each offer, ghouls rose from the earth and brought him nourishments; and then he had truly become a Necromancer. For many months Murch travelled the lands of the bunnies, committing acts of evil wherever he went. His dancing ghouls disrupted traditional country dances in Bunwell and Shagmuch; his coughing zombies interrupted sermons in St Leporid, Harewich and Rabston. Even in the capital of Lagonia itself, his undead monstrosities frightened the faithful with their presence, unholy reminders of a life beyond copulation and food. A crusade was begun then, approved by the highest authorities of the Church; warriors of the Bunny Lord went forth in great numbers to slay Murch the Necromancer. For some time he evaded them, but their numbers were too great; in the end they surrounded him in his tower. The siege of that tower is legendary by itself; for twenty days the crusaders withstood Murch’s onslaught of magic. Lightning fell from the sky to roast them, and the dead rose to mock them with their impurity. The doors of the tower were sealed by magic, and Murch set their engines of war on fire with his spells. It took thousands to finally defeat him. On the twentieth day, having fought for so long without stopping, Murch was overcome by tiredness, and a brave crusader climbed the walls of his tower. Finding Murch asleep, the brave crusader ran him through with his sword, becoming the greatest champion of Good in the history of Bunnydom. And all remembered his name, and the names of the warriors and churchmen who brought down the greatest evil of their time, and celebrated their victory for a thousand generations. Or so it would have happened if the Land of the Bunnies had not been ravaged by a copulation-related disease, all methods for the prevention of which were declared sinful by the Church. Lagonia is a ghost town these days. As for Murch, he discovered that at least some of what the Church taught was true. He now lives happily in Katsouli, the Land of Cats, where he is a renowned entertainer. His dancing ghouls are at least as legendary as the siege of his tower, bringing in visitors from all across the Lands of Dream. He is married to a gerbil and enjoys copulating and eating, but not in ways approved of by the Church. This entry in the Oneiropolis Compendium was made possible by Robb Kinnison.